Has it been over a week since I last posted? So much for my New Year's resolutions. I was determined to post twice a week but somehow, amid everything, the blog got neglected yet again. Actually my journal hasn't had an entry since April 2009 so it could be worse. The thing is, I have been truly busy with all things raw and more than just the blog is falling to the wayside. My holistic nutrition studies, my music, my social life are all on temporary hold. 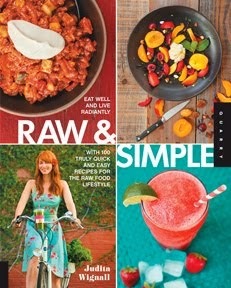 I have recently been offered a book deal to write a raw food recipe book with a really great publisher. I've been working on recipes for some time but now that I have deadlines and high expectations my time is spent either in the kitchen or on my laptop researching and writing. It's been amazing so far and it's exciting to see it already taking shape. I'm making the book that I wanted when I first went raw, a book for the uninitiated and intimidated. My dream is to see raw foods become mainstream, so this is my labor of love to get the information out in a way that makes sense and is easy to follow. It's also the main reason I haven't posted new recipes or photos on the blog or website. I'm saving them for the book but I'll probably be able to spare a few here and there, especially come summer time. Just an FYI that I recently started a YouTube channel that is going to feature a variety of lifestyle and raw related topics. I'm currently shooting my ex-supermodel brother-in-law's 30 day raw food journey (he's in his boxers, you don't want to miss that one!) and I'm going to show you how I trained my cat to use the toilet. There will be some product reviews, food demos and much more. Once the book is completed I'll have more time to work on the videos so check back regularly for updates. Other things on the agenda: another trip to Costa Rica in February, Longevity conference with David Wolfe in March and Coachella in April. If anyone is going my way let me know! How exciting... I can't wait till your book comes out! That's SO awesome!!! Congrats! I'd LOVE to review the book when it comes out for my website and perhaps you can come speak at once of my classes or potlucks!! Alysha, I'd love to come to one of your potlucks. You've come a long way since we emailed a few months ago. Congrats on doing what you love. That would be loverly! We are having one Feb. 12th @ the Environmental Nature Center if you are not busy! I'm trying, it is very difficult since I am kind of going at this with a blindfold on, but I just keep focusing on the food and the rest just seems to fall into place! And for that I am so greatful! Thank you, once again, for your advise in the beginning! Such is life. I can't wait to see the book though! Don't know if we're going to Coachella this year but I'll keep you posted.